It's amazing what some time off work does. 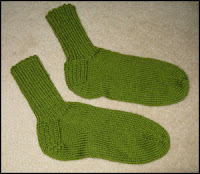 I finished the very green socks. They are as yet unblocked so they still look a little misshapen. 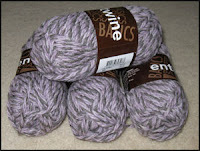 Yarn: Shepherd Colour 4 Me 8 ply. It's deliciously soft. Pattern: Silver's Sock Class. This tutorial is for DPNs, but I used the magic loop method. Knit Picks 3.25mm, 80cm circular needle. 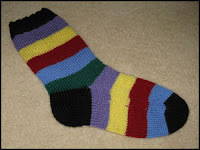 I have finished one of the striped socks... but it's too big (wide) for me. It does fit the other half (kind of) but he did not look overjoyed when I suggested I complete the pair for him. If I can't find anyone to fit it then it might be remain an orphan. It might make a good Christmas stocking. Now if you'll excuse me, I'm going to go cast on something using this new yarn. It's going to be garter stitch and chunky, for a break from the sock work.